Podcast 095: Can I Do This? Home / Articles • Podcast / Podcast 095: Can I Do This? Ever ask yourself the question: Can I do this? We don’t have to be a child to feel warmed, encouraged and empowered by the above words. 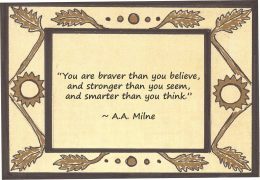 Taken from from A.A. Milne’s adventures of Winnie the Pooh, the adage recalls wisdom imparted to the young Christopher Robin from his trustworthy and devoted teddy bear friend Pooh. The familiar quote offers strengthening advice for a young boy who would one day become a man. But for many of us who remember hearing these words as children, the message still echoes like pearls of hope and expectation today. The question arises when we consider our hopes, aspirations or visions for the future and doubt our ability to achieve them. “Can I do this?” is sometimes vocalized, but more frequently internalized. The enormity of the question can sometimes haunt us from within. It reaches to the depths of our sense of self. We measure what’s required of us for success against the limited courage, strength and smarts we believe we possess. This week’s podcast speaks to that very question that recently arose as I observed a group of young adults. They were aspiring to heights that exceeded their previous life experience but knew that their hopes and expectations would force them to step up — and into — bigger realms of the unknown. If you’ve ever doubted yourself and wondered if there’s a braver, stronger and smarter you waiting to be revealed, I hope you listen in to Podcast 095: Can I Do This? Wishing you the happy fulfillment of your life’s innermost quest! Learn how to uncover, unlock and live out your “biggest” and most satisfying self with this immersive, multi-media course on emotional intelligence. As an endorsed coach for Law of Attraction magazine, my self-study program has been referred to as an “awakening and fulfilling course” and a “must have, taking us to who we truly are – love & joy.” Click here to order Foundations of Happiness. On a more practical level, learn just what you can do! Whether it’s piano or drums, painting or ballroom dancing, learn and master something new. Click here for access to this award winning self-study series from featured sponsor Learn & Master.